CANDOR - Roger Duane "Pete" Peterson, 69, of Manor Care Nursing Home, formerly of Candor, died Monday August 2, 1993. There will be a private graveside service. Mr. Peterson was a native of New York, a veteran of World War II, and a cartoon artist. Surviving are sons, Ron Peterson of Troy, Bill Peterson of Candor; daughters, Mrs. Candice Ballard of Sarasota, Fla., Mrs. Penny Patterson of Tenn.; brothers, Howard Peterson, Kenneth Peterson, both of Lakeland, Fla.; nine grandchildren. The family will receive friends 7-9 tonight at the home a son, Bill Peterson, Dowd Road, Candor. Lanier-Briggs Funeral Home of Candor is in charge of arrangements. 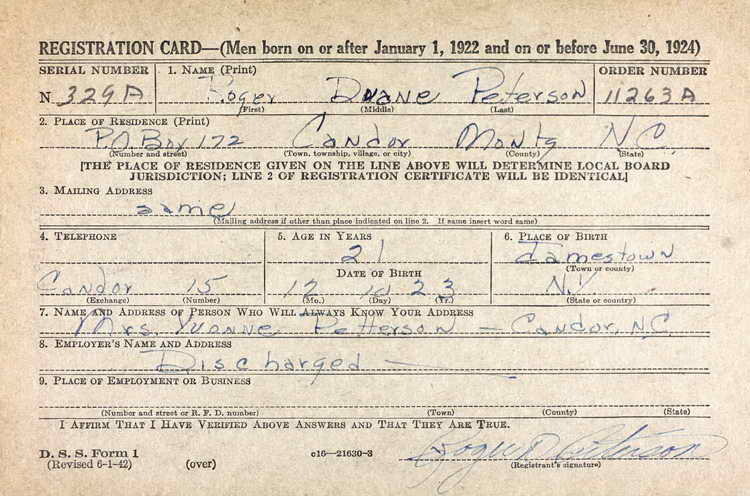 Draft registration card for Roger D. Peterson of Condor (Montgomery county), North Carolina was updated to reflect that he had been discharged. Note that his telephone number shows that the exchange was "Condor" (the town's name) and "15" being the home phone. With today's Condor population exceeding 3,000 families, that number would be quite different. Roger died on 2 August 1993 in Pinehurst (Moore), NC, less than 5 miles outside the Fort Bragg perimeter and only 20 miles from his hometown of Condor.